The Google Sandbox is an old school SEO term that refers to either an algorithmic penalty or the confinement and suppression of a search result for violation of Google’s guidelines. Despite some disagreement over whether a sandbox ever existed many believe their websites continue to fall victim to Google’s constraints. As a digital marketing agency that helps Plumbers succeed online some of them ask us about being sandboxed prior to investing in our service. Our response if the same to everyone. SEO is not the same as it used to be. Prior the the Penguin algorithm update in 2012, lots of black hat tactics were engaged in regularly by SEO agencies. When Google started to drop the hammer on websites that benefited from them, terms like sandbox were thrown around quite often. Things like hidden text and 500 word title tags were examples of tactics that became subject to the wrath of Google’s newfound idealism. 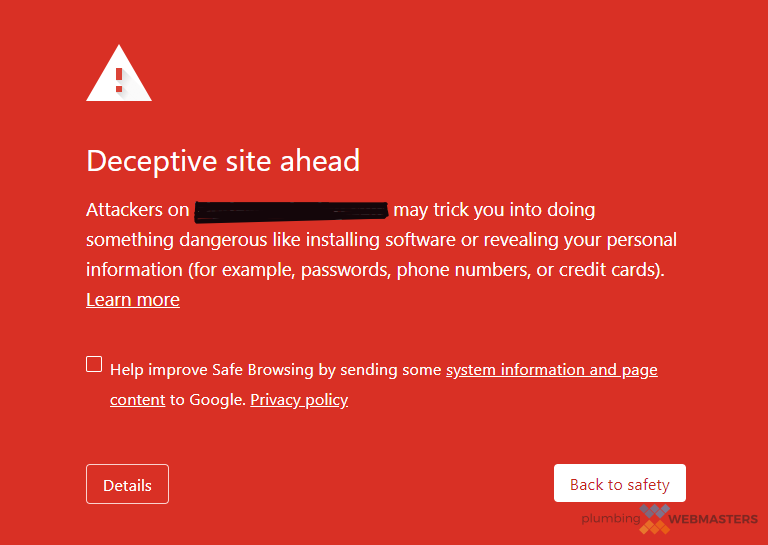 If your website has been hacked a giant red notice will appear to all visitors. Needless to say this is bad for SEO purposes and it can be a reason why Google would dismiss you from search results. One of Google’s duties is to protect its users from viruses or unsafe web interactions like phishing. A website that has been flagged for being hacked will never perform well online. Even if some users do reach your website they won’t stick around. While hacks are not assuredly a “sandbox” penalty, they are unequivocally detrimental to your plumbing company’s web efforts. Being sandboxed on Google Maps can be a result of reviews or lack thereof. While you might have hundreds of reviews on Angie’s List and HomeAdvisor having zero on Google is a bad look. 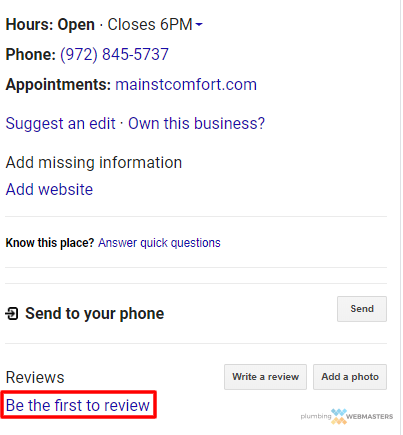 That’s not to say you get no credit for other reviews but having at least some on Google gives you far more credibility, particularly when it comes to Google Maps rankings. Competitors with more reviews than you may rank higher on Maps even if you feel their plumbing services are inferior. They may be horrible at plumbing but if they have a good reputation, it’s irrelevant. Most ranking problems can be traced back to poor website quality. This can be from the perspective of content, design, and most commonly; a combination of both. Most plumbers who call us for help have a template website that they mistakenly believe is custom. These sites are not custom folks. They are templates that have been duplicated repeatedly with slight tweaks to put your logo and contact information up. Google prefers custom codebase with schema markup so it better understands what a website offers. Plumbers should invest in custom. Is The Google Sandbox a Myth? The possible “sandbox” penalties we’ve listed can be attributed to a wide range of terms. Not everyone will attribute the problems we noted to a sandbox. The reality is that Google has never confirmed the existence of a sandbox and because of the paranoia that exists within the SEO industry, it’s just as likely that it is a myth. What we do know however is that certain qualities on a page will influence its ability to rank. What kind of terminology you want to ascribe to such concepts as entirely up to you but what we know as a digital marketing agency for plumbers is that our clients are successful when they have custom websites optimized for search and coded cleanly with schema markup and mobile usability. There’s really no complicated way to deny it.